Schematic drawing of reflection mode silk biosuperlens imaging. 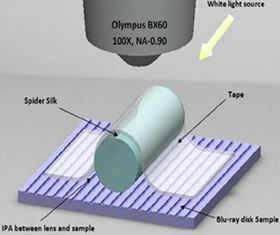 The spider silk was placed directly on top of the sample surface by using a soft tape, which magnified the underlying nano objects 2–3 times. Researchers from the universities of Bangor and Oxford in the UK have used spider silk to develop a natural biological superlens for the first time. When applied to the surface of a material, a cylindrical section of dragline spider silk from the golden web, or Nephila, spider was found to improve upon the limit of a traditional microscope’s resolution by up to two or three times, proving that the resolution barrier of microscope can be broken by bio-superlens. These lenses could find uses for observing engineered nano-structures, biological micro-structures, and even germs and viruses. Extending microscopy has long been the subject of intense research, with the objective of overcoming the difficulty of viewing objects smaller than bacteria with a normal microscope alone. Superlenses, or super-resolution lens, make it possible to see beyond existing magnification limits, and have the potential to be a game-changer in optical microscopy, especially for biomedical and material science applications. The team were keen to identify a naturally occurring superlens, one that wouldn’t involve complex engineering processes. Led by Zengbo Wang, they pioneered the first microsphere nanoscope, which utilizes engineered microsphere as a superlens to improve resolution and magnification, as well as a new type of superlens based on small high-index nanoparticles. While playing with his children in the garden, Wang realized that transparent spider silk could be a candidate for a superlens. The study, reported in Nano Letters [Monks et al., Nano Lett. (2016) DOI: 10.1021/acs.nanolett.6b02641], provides a strong foundation for the development of a new class of superlens based on biological species. The superlens functions by focusing light beyond the diffraction limit, and the cylindrical structure at a micron and submicron scale means that the dragline spider silk filament is ideal as it offers a one-dimensional viewing image along its length. The silk lens operates as a microfiber lens, whose imaging characteristics, performance and mechanism are quite different to other superlenses in the field. They showed that the microfiber lens can significantly improve the imaging window size, and is key for achieving high-speed, large-area super-resolution imaging. They tested some applications based on these lenses, including nanoscopy, imaging and spectroscopy. As Wang points out: “Importantly for potential commercial applications, a spider silk nanoscope would be robust and economical, which in turn could provide excellent manufacturing platforms for a wide range of applications”. The team is now looking to apply the technology to imaging biological samples, live cells and viruses, and using the superlens for other applications such as nanofabrication and nanosensing. The research could also lead to the development of biology-based optical systems that can offer new ways to integrate optics in biological systems.